Miskin Manor is a grade II listed country house situated in 22 acres of landscaped gardens in the heart of the Welsh countryside (approximately 8 miles away from Cardiff city centre). There are 43 guest rooms, which are all individually furnished. The majority of the guest rooms have fabulous views out across the gardens. There is a relaxing lounge bar (with an open fire) and an award-winning restaurant for guests to enjoy. There is also a leisure club on-site, just a short walk from the main building. Miskin Manor has for many years provided the ideal setting for wedding day celebrations. 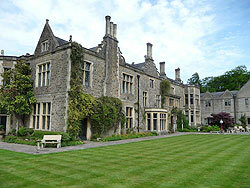 Update Feb 2009: Miskin manor has now completed the £600,000 renovation of its health club and spa. Relaxing lounge bar with open fire. Conference and banqueting facilities for between 4 to 160 guests. Wi-Fi Internet access in public areas.